Blizzard Entertainment has announced that StarCraft II: Wings of Liberty achieved a day-one sales milestone of more than 1 million copies sold worldwide, making it the best-selling PC game of 2010 within its first 24 hours of availability. 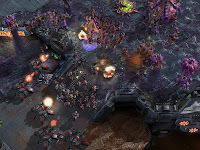 The game went on to sell a total of more than 1.5 million copies in its first 48 hours, setting the record for fastest-selling strategy game of all time. StarCraft II: Wings of Liberty was released simultaneously in North America, Europe, South Korea, Australia, New Zealand, Russia, Brazil, Chile, Argentina, Singapore, Indonesia, Malaysia, Thailand, the Philippines, and the regions of Taiwan, Hong Kong, and Macau on July 27th. More than 10,000 stores throughout the world opened their doors at midnight to celebrate the release, and Blizzard Entertainment developers were present at several locations to commemorate the event with players and sign copies of the game.